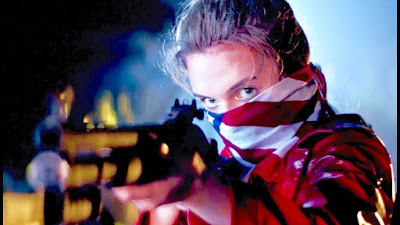 My love for Sam Levinson's edgy, violent, and topical Assassination Nation knows no bounds; I've been a huge supporter since seeing it at Sundance early this year. That said, I understand if others who haven't experienced it are a little confused. The teaser was just a bunch of buzzwords and trigger warnings, but what is the movie actually about? To be fair, the latest trailer, a full-on red band spectacle, doesn't help matters much. I'm afraid a shock & awe campaign is being wadged and I'm not sure it's the smartest way to hype the film when the story and cast are compelling enough. Suki Waterhouse, Odessa Young, Abra, and trans actress Hari Nef play a fearsome foursome of high schoolers who must fight for survival when a hacker shares the entire town of Salem's most personal secrets, causing it to explode into chaos. The rest of the cast includes Anika Noni Rose, Colman Domingo, Maude Apatow, with Bill Skarsgård, Kelvin Harrison Jr., Joel McHale, and Bella Thorne. Oh yeah, it's also produced by Joe and Anthony Russo, those guys in charge of that whole Avengers: Infinity War thing. Here's hoping further trailers lean more on the plot rather than shock tactics. Assassination Nation opens September 21st.